2019-04-03 - Working Like A Dog…Service, Therapy, ESD, or Pet? 2019-03-30 - Wings To Fly "HOPE"
2019-03-22 - The Chipper Experience! Where COMEDY and MAGIC Collide! 2019-02-24 - The Magic of Bill Blagg, Live! 2019-02-08 - SOLD OUT ~ Al Di Meola "OPUS 2018 and More"
2019-01-25 - Kathleen Madigan "Hotdogs and Angels Tour"
2018-11-29 - Going … Going … Gone! 2018-05-05 - An evening of "Page & Plant"
2018-03-11 - SOLD OUT ~ Pop, Rock, and Doo Wopp Live! 2018-03-02 - Get A. Grip, A Hilarious New Comedy! 2017-10-09 - An Evening with John Popper: The Hits. The Stories. The Experience. 2017-08-12 - Get A. Grip! 2017-05-30 - Tickets on Sale to Lyric Members Now! 2017-05-17 - Love The Lyric! Donate on The Great Give, May 17th! 2017-04-30 - Disney's The Lion King Jr.
2017-03-11 - Walter Parks "Swamp By Chandelier"
2017-02-25 - 3 Redneck Tenors "Shut Up and Sing!" 2017-01-23 - Jarrod Spector "A Little Help from My Friends"
2017-01-19 - Kathleen Madigan "Mermaid Lady Tour"
2017-01-14 - The Five Irish Tenors "Voices of Ireland"
2016-10-14 - John Mayall "Living The Blues"
2016-02-26 - SOLD OUT ~ Rosanne Cash with John Leventhal "The River and the Thread"
2017-03-23 - Doc Grober & The Mudcats "The Jazz Age"
2016-02-18 - Franco Corso "That's Amore"
2015-12-11 - Vote for The Lyric! Macaroni Kid Gold Daisy Finalist! 2015-12-05 - Franco Corso "My Italian Christmas"
2015-09-13 - Celebrate National Arts & Education Week 2015! 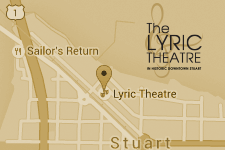 2015-09-08 - Coming up at The Lyric! 2014-09-02 - Lyric Theatre 2014-2015 Tickets ON SALE to the Public!